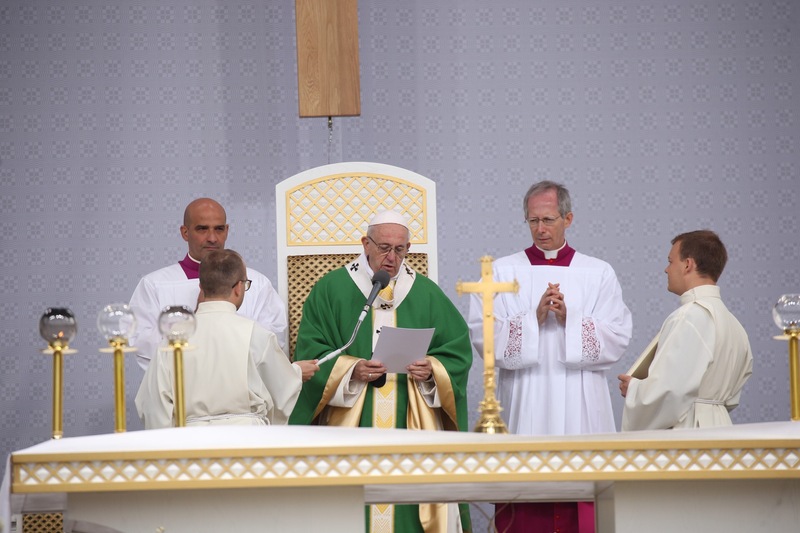 Pope Francis led the Angelus prayer today from Kaunas, Lithuania, after celebrating a multitudinous outdoor Holy Mass in the Baltic country. He typically leads the Angelus every Sunday from St. Peter’s Square. It is broadcast live throughout the world. In remarks before the traditional Marian prayer, the Holy Father noted that where different forms of conflict and and war emerge in the world, Christians should remain steadfast in their efforts to respect others, heal wounds, build bridges and strengthen relationships. After reciting the Angelus, Pope Francis offered his greetings to the President and authorities of the Republic of Lithuania as well as to the country’s Bishops and all who contributed in various ways, especially with prayers, to his current visit. The Holy Father noted that later in the day he would pray before the Monument to the Victims of the Ghetto in Vilnius and asked the Most High to bless dialogue and shared commitment for justice and peace. He then departed for the Curia of the Archdiocese of Kaunas for a lunch with Lithuania’s bishops.